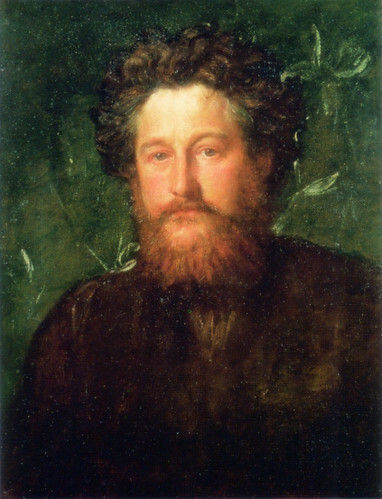 William Morris was an English textile designer, artist, writer, and socialist. Morris was educated at Exeter College, Oxford, where he developed an interest in art and the Middle Ages and became friends with artists such as Burne-Jones. He read a great deal of theology and ecclesiastical history. He was involved in the formation of a ‘Brotherhood’ for the creation of religious art. Influenced by Rossetti he painted and concerned himself with production of beautiful books and house decoration. Morris wrote long poems which indicated his move away from religion. The title of a long poem The Earthly Paradise shows a preference for a secular heaven. His lines ‘Fellowship is heaven, and lack of fellowship is hell ‘ from A Dream of John Bull suggest that the bond of friendship was human and of this life. ‘Fellowship’ also indicates his move towards the comradeship of socialism. In the 1880s he took an active interest in socialism, which he considered meant the creation of an ideal society. His Utopian novel News From Nowhere depicts such a society. By this time he was quite critical of religion and is said to have attacked Christianity with zest. Yet he always took a greater interest in socialism than in freethought. However in the latter part of his life he devoted himself almost entirely to artistic and literary work. A famous quotation comes from Hopes and Fears for Art : ‘Have nothing in your houses that you do not know to be useful, or believe to be beautiful.’ A very secular ideal. William Morris gave a famous address ‘Art and Socialism’ at Leicester’s Secular Hall on 23 January 1884. He also met Ernest Gimson there who later became a follower of his ‘Arts and Crafts’ movement, and a craftsman in his own right.